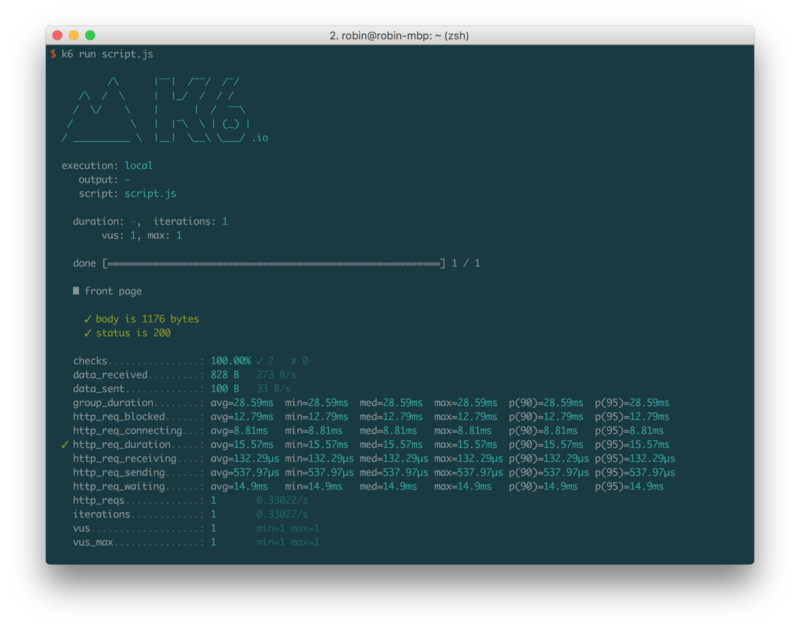 k6 is an open source load testing tool built for modern DevOps teams. Use it throughout the software development lifecycle to test the performance of your websites, web apps, APIs and microservices. Stay on top of performance without fuzz. We believe great developer tools should be open source and come with great documentation, allowing for a community to form around the tool. Visit the Github repo to see the code, roadmap and other information. k6 is built to integrate into your development environment as well as your Continuous Integration (CI) or automation environment. That's why k6 is a command-line tool with features like custom metrics, checks (like asserts) and thresholds. You have several result output options, including LoadImpact Insights for automated results analysis. Run tests from your local machine to debug a test script or to get quick performance feedback before pushing code to version control and CI. Run tests from on-premise machines or cloud servers under your own AWS, Azure or GCP account. For convenience and to scale out, you can move your scripts without changes to run on Load Impact's global cloud infrastructure. Create ES6 JS modules that can be reused across tests and teams to build a foundational performance testing library for your organization. Checks (like asserts) are used to validate functional aspects of your test. Thresholds is the essential feature that you use to specify the pass/fail criteria of your tests. You can create thresholds based on any of the standard metrics collected by k6, as well as any custom metrics that you define. Ready for the present and future k6 supports performance testing systems that talk HTTP/1.1 HTTP/2 and WebSocket. Besides the standard ES6 JS APIs, k6 comes bundled with APIs to handle Cookies, Crypto, Encodings, Environment variables, HTML forms, HTML parsing, Multipart requests, TLS client certificates, TLS ciphers & versions and more. Whether you run your tests from a machine that you manage or from the Load Impact cloud service you can easily integrate performance tests into your favorite CI tool like CircleCI, GitlabCI, TravisCI, JenkinsCI and TeamCity.